I work as a horseback riding instructor at a therapeutic riding center, so sometimes have to run alongside a trotting horse carrying a child. The riding arena is covered with soft sand about 10cm deep, so the footing can be very uneven. About 2 weeks ago, my right foot started hurting while running, especially in the heel. I figured it was probably plantar fasciitis, especially after a jump forward from the right foot gave me a very sharp pain. (About 3 years ago I had plantar fasciitis in the left foot, and a similar jump caused a rupture - x-rays showed no bone damage, and with conservative treatment the foot healed nicely.) This time I went to the doctor again, had an x-ray (copy uploaded), and was told that it's just plantar fasciitis again. However, the ankle feels unstable, as though if I don't put my weight down carefully it may collapse, and the bottom of my foot from the arch to the toes feels sometimes numb and sometimes burning. There is swelling on the medial side of the heel, and very light bruising forward of the heel on the side of the foot. Conservative treatment of icing, topical analgesic Voltaren, and elastic bandage for ankle and arch support are helping, as well as not running in the sand. 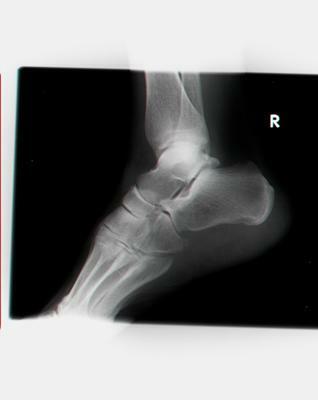 My question is this: a friend - not a doctor, but with some medical experience - looked at the x-ray and said it looks to him as though there is an avulsion fracture of the cuboid bone, and I should have it treated. I've no idea whether he is right or not, and don't want to go back and bother my busy GP if the friend is wrong. What is your opinion of the x-ray? Unfortunately the uploaded xray is about the size of a postage stamp so I cannot see it. Swelling on the medial side of the heel would not be from damage to the cuboid bone. I am concerned that there is some nerve damage as you are having burning and numbness on the bottom of the foot and the swelling you describe is where the nerves enter the foot. I think, if the symptoms are not improving at an acceptable rate, that you need to see a doctor who is more experienced at treating foot problems then your GP. Your problem may require an MRI. Ankles swollen, both feet. Capsulitis in right foot now. Fasciitis is gone. Got orthotics. Some help but I am going to get larger size shoes. Some burning by 2nd and 3rd toe on right foot. No pain in ankles, just swelling. We were on a 13 hour trip in airports last Sat., today is Wed. Sat most of the day and then long walks. Any advice on ankles? If the swelling is the result of flying and much walking in the airport, since that is over, the swelling should subside. I am making the assumption there is no calf pain and the swelling appears better in the morning and worsens during the course of the day. If not gone in 7-10 days, consult your doctor.